When I first created a set of values for my company, I did so based on the belief that values should be HARD. Over the past several months, I’ve shared the importance of each value through the lens of these criteria. And while I leveraged my company’s values to anchor the discussion, the goal for values driven entrepreneurs is to create a set of ideals that speaks to the needs of each member of your team and simultaneously builds the best people and organization. LIVE AUTHENTICALLY, BE RESOURCEFUL, DELIVER QUALITY, EXUDE PASSION, CREATE TRANSFORMATIONAL EXPERIENCES and BUILD AND SUSTAIN COMMUNITY is the language of my company, but I truly believe that most enterprises are trying to achieve many of the same principles and outcomes with their own values. Anyone who knows me understands I can get pretty excited when I talk about this stuff. But while each value can stand on its own, what really gets me going is the interconnection of all the values. They work together and build upon each other to create an unstoppable force that becomes bigger, faster and more fluid as it gains momentum. That’s why it’s the Values SnowballTM. While a bulleted list of actionable virtues is a great start, I believe the intentional interdependence of values is a distinguishing characteristic. For this last post in the series, I’d like to spend time elucidating the Values SnowballTM and what it means to me. Many laud the beauty and individuality of snowflakes, but there is an undeniable power in amassing each flake into the collective force of a snowball. Likewise, the Values SnowballTM relies on the existence of individually strong principles that build on the former while also being the bonding agent for what follows. To look at a snowflake and a snowball is to look at two different objects with many unique properties. Yet the snowball is, in fact, the end product of a “long series of sequential events.” So this is the opportunity that the classic approach to values misses. Yes, each value might be poignant on its own, but what happens if these independently strong ideas were to work together, allowing their forces to multiply? Is it possible that the end result will be something entirely new? Absolutely. First, let’s start with the weather report. If the conditions aren’t just right, no matter how much you dream of a white Christmas, there will be no snow, much less a snowball. In the case of the values driven entrepreneur, you must first create the environment for people to Live. Learn. Grow.TM. This critical climate, a place of feeling and sharing value, allows each person to uphold a set of tenets that unites and connects those around them. Once the conditions are right, the first three values— Live Authentically, Be Resourceful and Deliver Quality—provide the internal momentum necessary to get the snowball rolling. These stem from the development of individuals, just as snow must retain its individual properties to provide the foundation for a snowball. By intentionally pursuing one’s purpose and finding ways to deliver on that vision, people live more fulfilled lives personally AND professionally. Each of these three values builds on the next and gains momentum. This then allows them to sustain the momentum of the other values. What was once just internal momentum within individuals is now converted to external energy. The next three values – Exude Passion, Create Transformational Experiences, and Build and Sustain Community are about harnessing that external momentum and unleashing it on the world. It is the area of greatest opportunity for values driven entrepreneurs. By understanding the multiplier effect: Passion + Principles + Purpose -> Resources, the Values SnowballTM allows the values driven entrepreneur to deliver even more assets to her organization. Therefore, the internal compass that drives the organization becomes the magnet that attracts more opportunities which results in outperforming the market. One of the elements of the Values SnowballTM that excites me most is that it builds on itself collectively and individually. 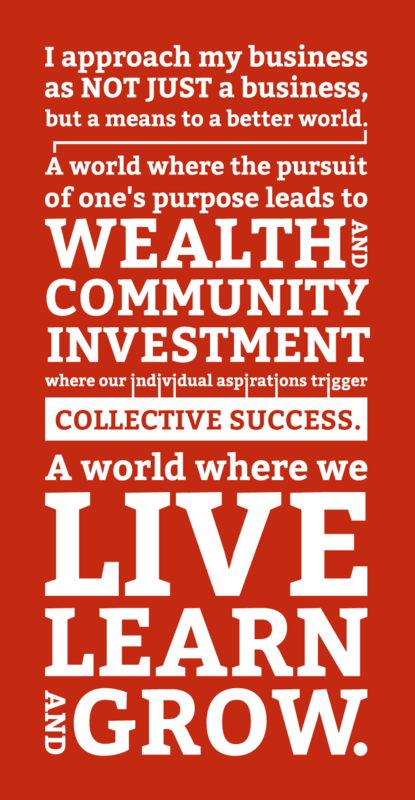 If you look at the image, you’ll notice that the red in “community” aligns with the red in “live”. That’s because you cannot go through the experience of living, learning, and growing without changing somehow. Your perspective about yourself, the world around you, even the purpose that you are most passionate about will evolve. And as you go through that experience, whether as the leader or member of a values driven enterprise, you will inevitably be forced to re-evaluate what living authentically means to you. And the community of rightful leaders around you will often influence you on what the next action should be as a result of your growth. One day, this will just be the way the world does business, and instead of a few snowballs, there will be many. And if all the values-driven entrepreneurs end up in one big values-snowball fight, my hope is that we will be on the same team, emerging victorious against the world’s most pressing problems.